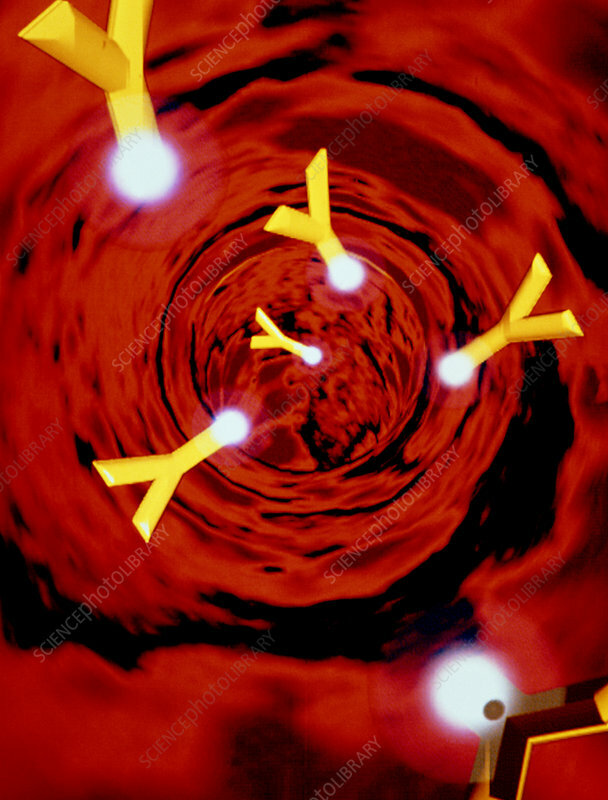 Computer graphics image of antibodies moving along an artery. Antibodies, special blood proteins, are synthesised in lymphoid tissue in response to the presence of a particular antigen (foreign sub- stance) and circulated in the blood plasma to the troubled site. A huge range of antibodies is produced, each with some slight structural difference enabling it to bind to the surface of a different antigen. The antibodies thus act as flexible adaptor molecules, so that a wide range of infectious agents may be recognised. Here, the arms of the 'Y' shape form the antigen binding portion (Fab), the rest is the Fc portion; this binds to Fc receptors on host tissue cells.